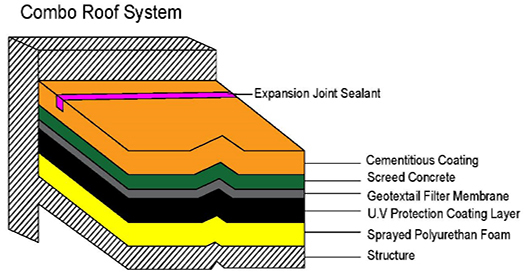 Combo Roof System is a comprehensive system comprising of waterproofing, thermal insulation and finishing for the roof. This unique system is a technically advanced fast curing. Dubai Central Laboratory (DCL) Certified PU foam system which forms joints free water proofing and thermal insulation is fully bonded to the roof slab.